An e-book cookbook written by Tatie Sri Wulandari due to a good response of visitors on her website www.tasty-indonesian-food.com. 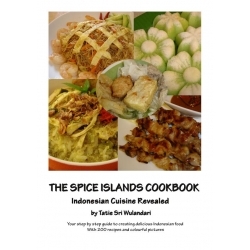 It is offering 200 recipes with description of dishes, information about spices, vegetables, and fruit used in Indonesian cuisine, description of tools used in indonesian kitchen, detailed instructions on how to create the dishes, colourful pictures more. The e-book is in english language.